Lineage. Constituted 349 Bombardment Squadron (Heavy) on 28 Jan 1942. Activated on 1 Jun 1942. Redesignated 349 Bombardment Squadron, Heavy, on 20 Aug 1943. Inactivated on 1 Dec 1945. Redesignated 349 Bombardment Squadron, Very Heavy, on 13 May 1947. Activated in the Reserve on 29 May 1947. Inactivated on 27 Jun 1949. 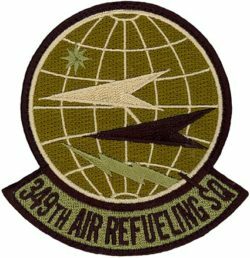 Redesignated 349 Bombardment Squadron, Medium, on 1 Aug 1955. Activated on 1 Jan 1956. 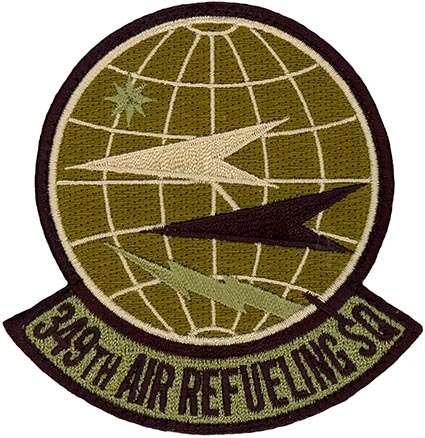 Redesignated: 349 Strategic Reconnaissance Squadron on 25 Jun 1966; 349 Air Refueling Squadron, Heavy, on 30 Sep 1976; 349 Air Refueling Squadron on 1 Sep 1991. Inactivated on 1 Jun 1992. Activated on 1 Jan 1994. Assignments. 100 Bombardment Group, 1 Jun 1942-1 Dec 1945. 100 Bombardment Group, 29 May 1947-27 Jun 1949. 100 Bombardment (later, 100 Strategic Reconnaissance; 100 Air Refueling) Wing, 1 Jan 1956; 9 Strategic Reconnaissance Wing, 15 Mar 1983; 9 Operations Group, 1 Sep 1991-1 Jun 1992. 22 Operations Group, 1 Jan 1994-. Stations. Orlando AB, FL, 1 Jun 1942; Barksdale Field, LA, 18 Jun 1942; Pendleton Field, OR, 26 Jun 1942; Gowen Field, ID, 28 Aug 1942; Walla Walla, WA, 31 Oct 1942; Wendover Field, UT, 30 Nov 1942; Sioux City AAB, IA, 6 Jan 1943; Kearney AAFld, NE, 4 Feb-1 May 1943; Thorpe Abbots, England, 14 Jun 1943-23 Nov 1945; Camp Kilmer, NJ, 29 Nov-1 Dec 1945. Miami AAFld, FL, 29 May 1947-27 Jun 1949. Portsmouth (later, Pease) AFB, NH, 1 Jan 1956 (deployed at Brize Norton RAF Station, England, 4 Jan-c. 1 Apr 1958); Davis-Monthan AFB, AZ, 25 Jun 1966; Beale AFB, CA, 30 Sep 1976-1 Jun 1992. McConnell AFB, KS, 1 Jan 1994-. Aircraft. B-17, 1942-1945. AT-6, AT-7, and AT-11, 1947-1949. B-47, 1956-1966; U/WU-2, 1966-1976; KC-135, 1976-1992. KC-135, 1994-. Operations. Combat in European Theater of Operations (ETO), 25 Jun 1943-20 Apr 1945. Bombardment training, 1956-1966. Worldwide strategic reconnaissance, 1966-1976. Air refueling in support of SR-71, 1976-1990. Provided cargo and air refueling support to combat units in Southwest Asia, Aug 1990-Mar 1991. Supported reconnaissance mission including aerial refueling and cargo transport, 1990-1992. Provided in-flight refueling services and airlift to American and allied forces globally, 1994-. Decorations. Distinguished Unit Citations: Germany, 17 Aug 1943; Berlin, Germany, 4, 6, 8 Mar 1944. Air Force Outstanding Unit Award with Combat “V” Device: 1 Jul 1972-30 Jun 1973. Air Force Outstanding Unit Awards: 1 Jul 1968-30 Jun 1970; 1 Jul 1983-30 Jun 1984; 1 Jul 1985-30 Jun 1986; 1 Jul 1986-30 Jun 1987; 1 Jul 1989-30 Jun 1990; 1 Sep 1991-30 Jun 1993; 1 Jun 1994-31 May 1996; 1 Aug 1999-31 Jul 2000; 1 Aug 2000-31 Jul 2001; 1 Aug 2002-31 Jul 2004; 1 Aug 2004-31 Jul 2005; 1 Aug 2005-31 Jul 2006. French Croix de Guerre with Palm: 25 Jun-31 Dec 1944. Emblem. Approved on 11 Jan 1977; modified in 1994.